In addition to working on Airball, I also volunteer with FIRST as a mentor for an FTC middle-school robotics team. Although our team did not make it to the World Championship this year, I decided to go anyway to watch, learn, and meet people. I live in Reno, and the event was in Houston – what better reason to fly my DA40 cross-country? It's about 15 hours of flying time each way, and I planned to do it over two days each way – with Airball attached, of course! The first problem to tackle was how to attach an Airball probe to my DA40 reliably and have it be easily removed, easily reinstalled, and not in the way of anything important. My previous flight with Airball used the tiedown point, but required replacing the tiedown eye bolt with a RAM ball mount. 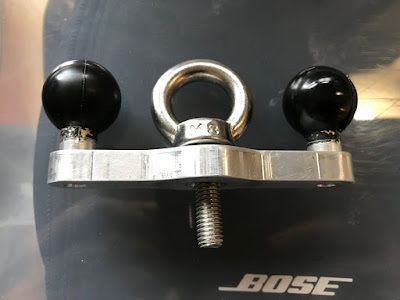 For the cross-country, I wanted to ensure the tiedown eye bolt was still usable even with Airball installed, so I redesigned the mounting system. A custom mount for DA40 wing tip tiedown bolts. This mount allows up to two RAM ball mounted devices per wing tip tiedown, so Airball and a GoPro can co-exist as well. In building and collecting data from the Airball probe designs up to this point we had not been terribly concerned with waterproofing the probe, because our data collection flights were generally on really nice days. I put some thought into how to (at least nominally) waterproof my probe so that I would not have to worry about whether or not to attach the probe on any given flight, and wouldn't have to worry about it if I ended up IFR in some clouds. The nose and the part that attaches it to the acrylic tube (which are 3D printed in two separate parts due to their geometry) are attached to each other with small screws, but I also glued them together with CA glue. I added rubber gaskets for the RAM quick attachment mounting hardware between the "saddle" part and the tube and between the "saddle" and the RAM mount. I glued the static probe into its hole with CA glue, and plugged its set screw hole with foam which was also CA-glued in. I sealed the gaps between the tube and the 3D-printed mount parts with kapton tape, so that they could still be disassembled if needed. Finally, the tail part has a slot which allows charging the probe and turning it on and off so it could not be permanently or even semi-permanently sealed, but I opted to just cover it with electrical tape and see how it did in flight. It was fine! 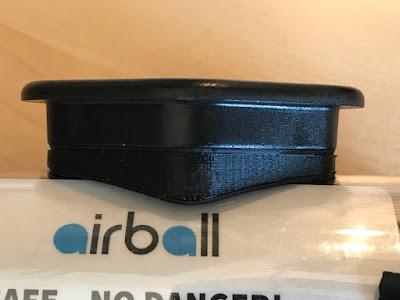 The Airball probe's mount "saddle" got some gaskets. 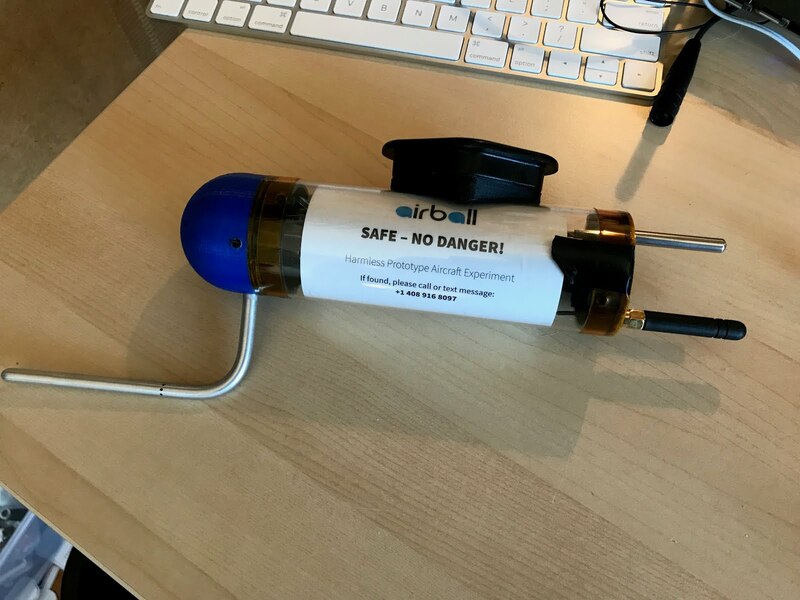 A ready-to-fly Airball probe (after returning from the trip). It worked well! We didn't get to fully test the waterproofing of the probe as there wasn't really any significant rain anywhere on our flight legs, but we went through a few clouds and got the probe misted pretty good, and it was rock solid. In order to collect data from about 30 hours of flying, I needed to get the Airball display into some sort of shape to be taken along in the plane without getting in the way. Unfortunately I ran out of time to get the actual Airball software up and running nicely, and given some recent software changes my probe wasn't talking to the Airball display software. However, I could run some logging software so that I could collect and log all of the flight data (which I can then compare to the data my Garmin G1000 logs, for comparison and validation purposes). Get everything to fit in a small package. 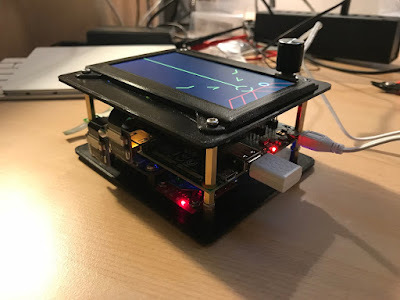 I made some 3D printed parts to hold the display and all the guts into a "sandwich" form factor that could be compact and sturdy enough to survive the plane trip intact. 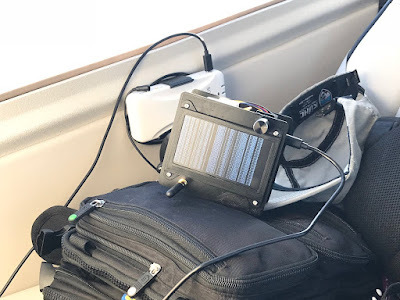 The Raspberry Pi doesn't have a typical PC's battery-backed real-time clock, so I added a Maxim DS3231 added RTC module so that it could keep time between flights without internet access to do an NTP sync at every boot. I added a radio antenna and mount which would, I hoped, maintain constant signal from the probe. The prototype display's "sandwich" form factor. My prototype Airball display "lovingly" placed in the back seat. The flight went well overall, and I look forward to sharing some of the data I collected! 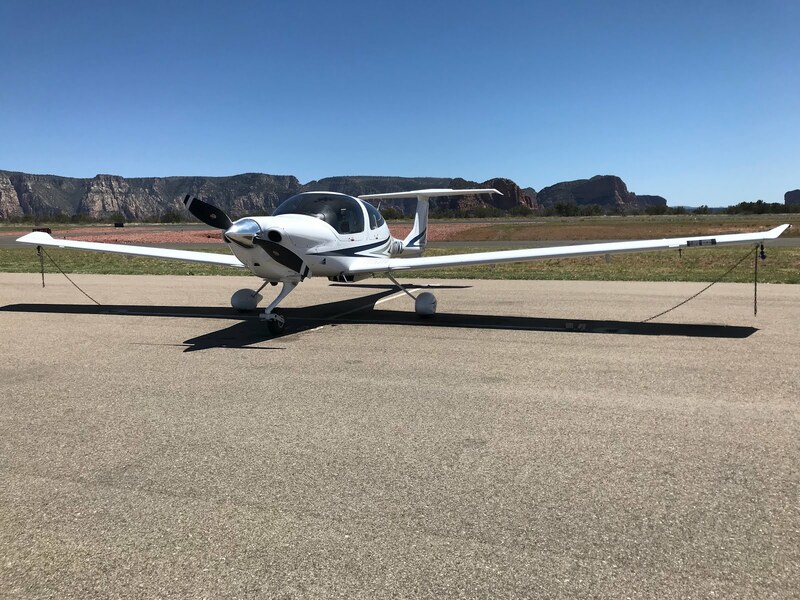 My DA40 parked on the ramp at Sedona (KSEZ).